I’ve been enjoying this sunshiny day by making some sweet new cards! 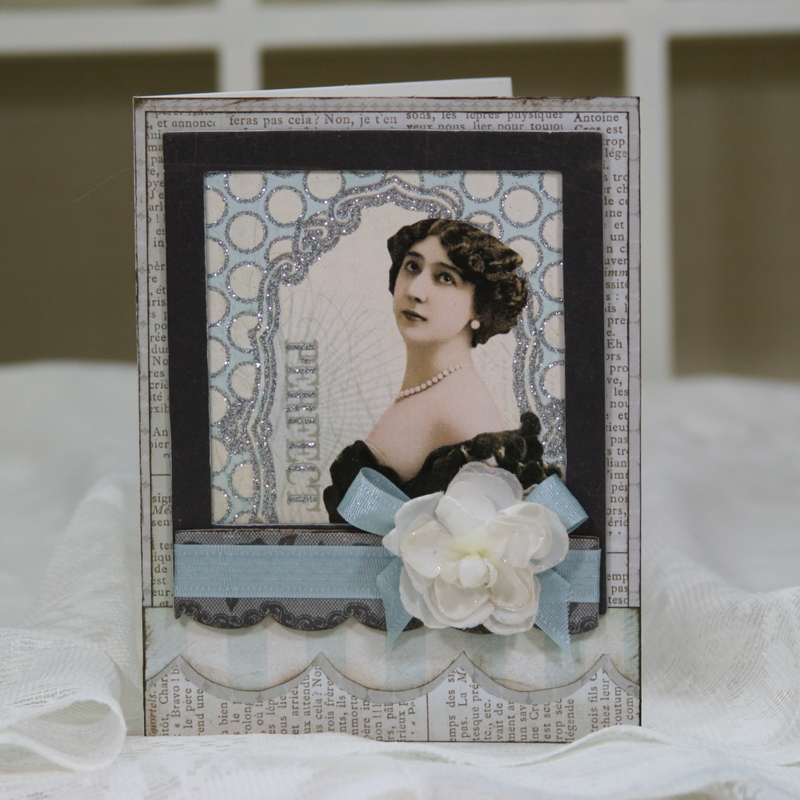 The first card if super shabby and vintage. 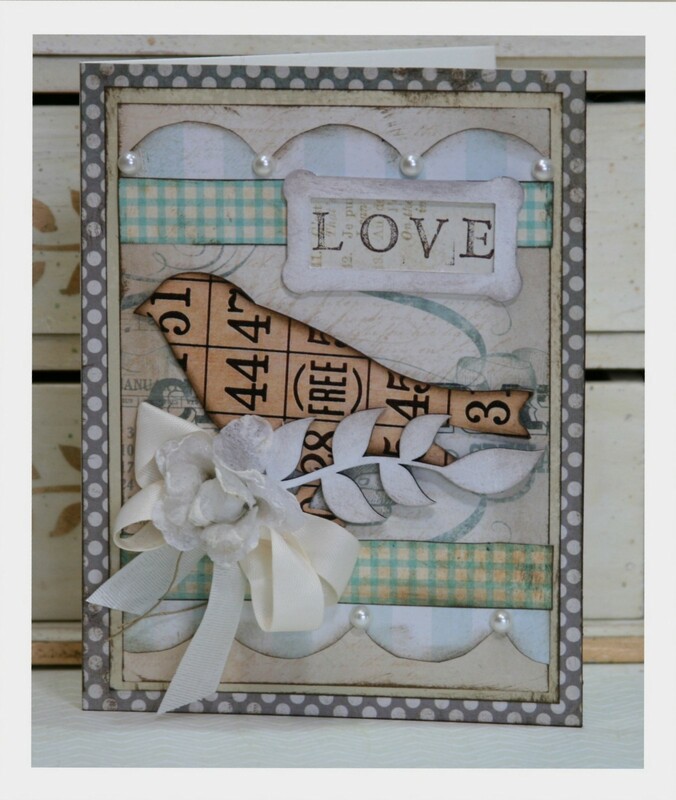 I made the birdy by covering a nice large chipboard shape with a bingo card image. I added way to many layers of dreamy colored papers and a gimongus ribbon bow with flower center. Lot’s of ink too and pearly accents to finish it off. Next is a Valentine Card with a traditional color scheme…but the patterns are more whimsical for an updated vintage look. The sweet little cherub is an image from Graphic’s Fairy. I layered her on top of a cut out from a sheet of My Mind’s Eye paper. Last but not least. This final card is my favorite of the day. I started with a brown craft paper base and layered on lovely patterns from M.M.E. There is a nice little detail accent with the border punched strip. The vintage image is from Graphic’s Fairy. I framed it with a dimensional chipboard that i painted, inked and stamped. I finished off the top of the frame with creamy ribbon and a coordinating flower with two beautiful glass headed pins from Maya Road. This is centered on a generous length of lace trim from Webster’s pages. All the inking was done with Walnut Distress ink from Tim Holtz and the stamping was done with chocolate ink from Stampin Up. I just love how this card turned out. Hope you all are having a sunshiny day too!!! Yay we got some good news back from the realtor that our proposal was accepted for the new location for the shop . I can’t wait to get settled in and get back to work. I thought it would be nice to create some new display items for our guests to enjoy for our grand reopening. I just love little containers to hold small treasures. They work great to keep the stock organized too! This project is also a nice way to upcycle those great wooden crates that clementines are sold in. We have a ton of them just waiting to be put to use. Right now it’s holding a nice supply of envelopes waiting to be worked into a project. I inked the edges of a lovely paper then added a glitter edge banner. A ruffled crepe is a nice girly finishing detail. I created this sweet little flower for the front of the crate…..but it just didn’t seem to match so I will find a different project for it. I started with a lovely sheet music vintage image from Graphics Fairy that I cut into strips and scalloped. I worked it into the layers of a velvety flower and ruffled it to give the flower lot’s of dimension. A few nice bit’s of lace to soften the edges. I’ll be happily working at getting the shop open so I can enjoy seeing all my Paper Peeps again. Hopefully by the end of next month. I have some great ideas for the shop to make it new and improved! Until then….I am enjoying hibernating and playing paper at home. Here are some sweet little spots I have linked to today. Stop by for a spell and check out all the great ideas! 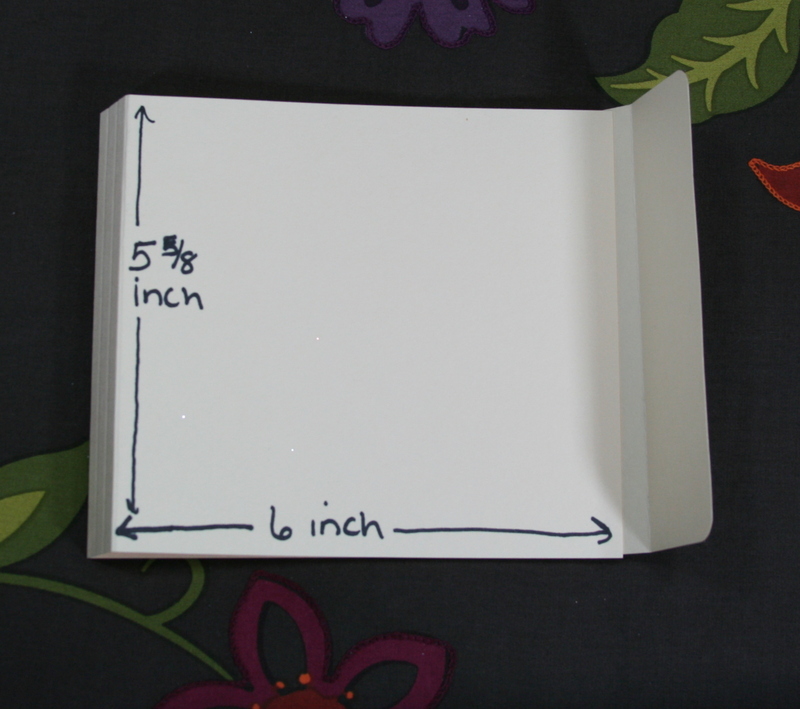 I want to share with you this sweet little book I created today. I managed to be much more productive today. Maybe the sun coming out put me in a more chipper mood. 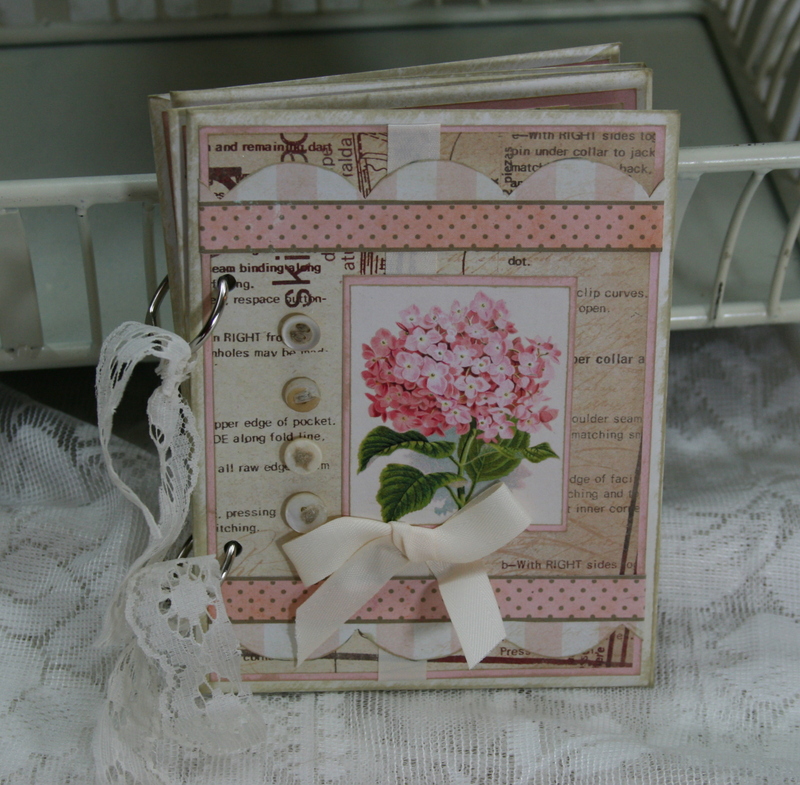 I used a nice variety of shabby chic patterns and soft colors to make this dreamy little book. A beautiful vintage image from Graphics Fairy is the star of the front cover. 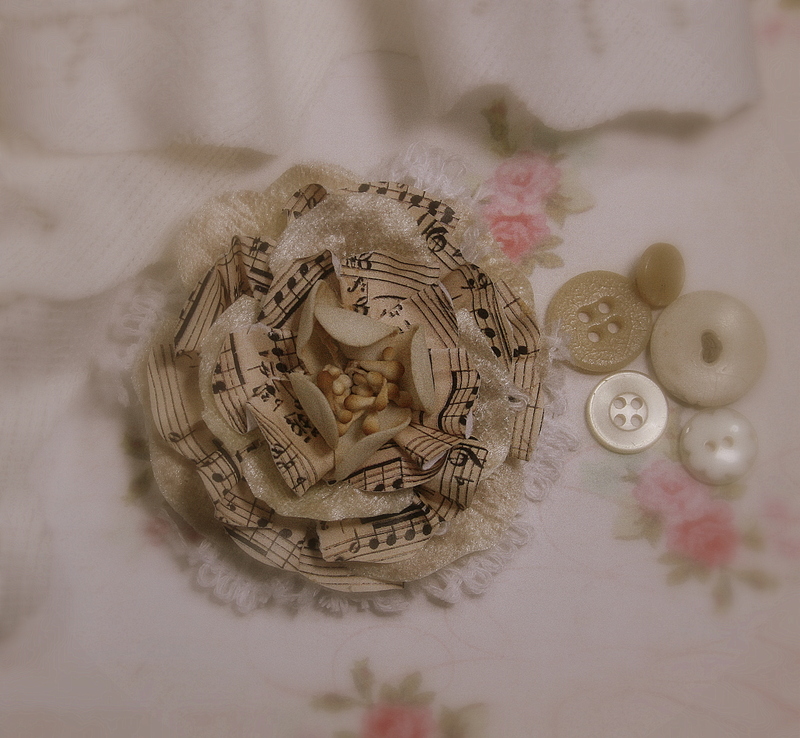 I added only a few simple embellishment like a creamy ribbon, buttons and lace to accent the binder rings. I inked the edges with Tim Holtz Old Paper Distress Ink. I really love the scallops and the dot patterned paper layers. Fabulous paper looks like a sewing pattern. The dress form is another image from Graphics Fairy. Last but not least…the back cover. I did have a plan to get many things done today. day here in Michigan. Just a little sunshine is all I ask. To get the cobwebs out of the corners of my brain. Wouldn’t it be lovely to wake up to 85 and sunny?? I did manage to get the tutorial done, and one very nice card. find out if I have any buried treasure. LOL. I think this pretty little lady is my favorite image from Graphics Fairy. 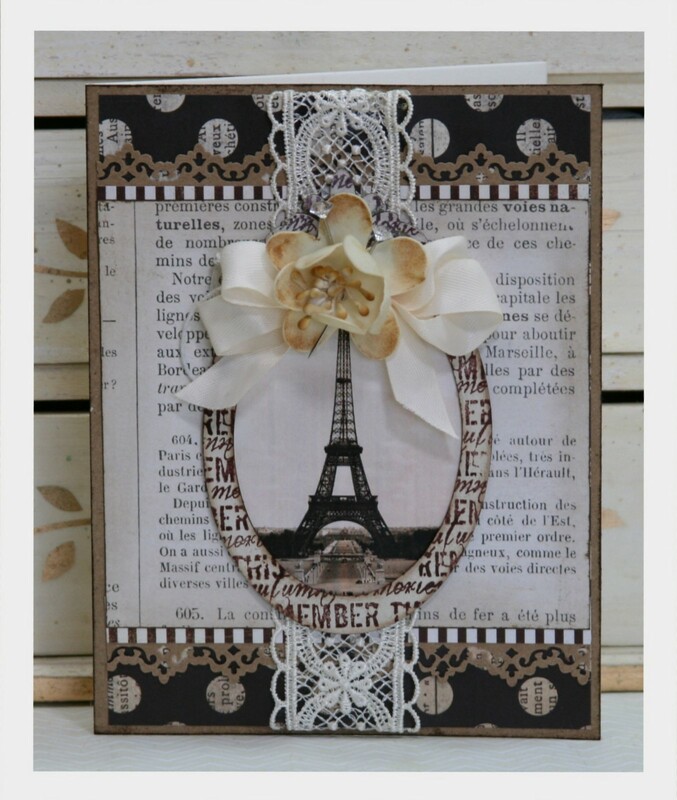 I layered her on lot’s of lovely papers with a French flair. The scallop and ribbon with flower are nice accents. had the sparkles built right in. I received this sweet dress form from D.H. Kenny for Christmas. 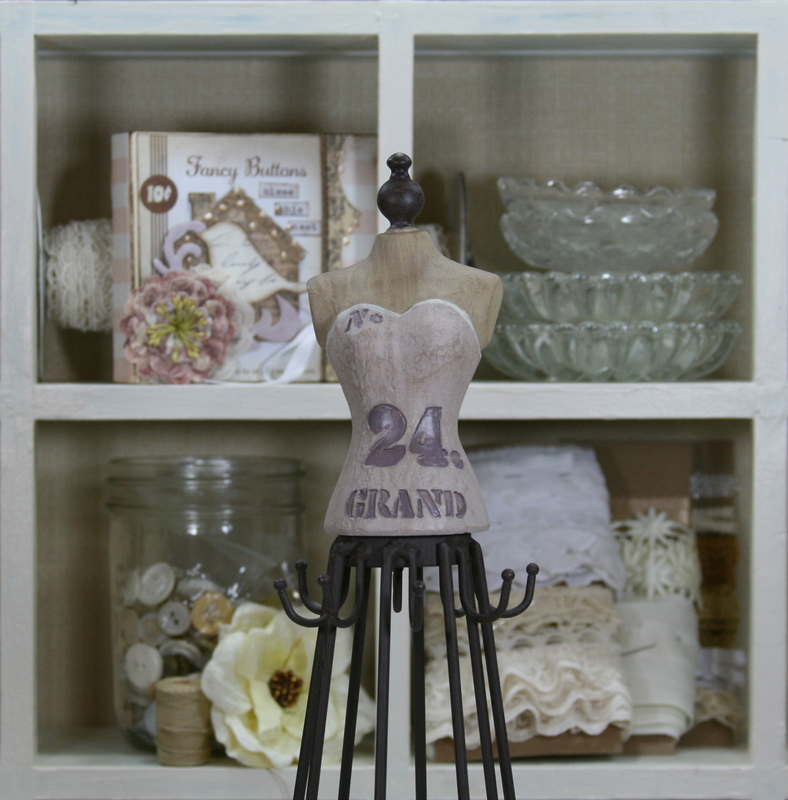 I am planning to use her in the shop to hold pretties on the counter. She’s quite tall and has all these wonderful hooks on her skirt to hang tags and such. I think she would be beautiful with button cards too. 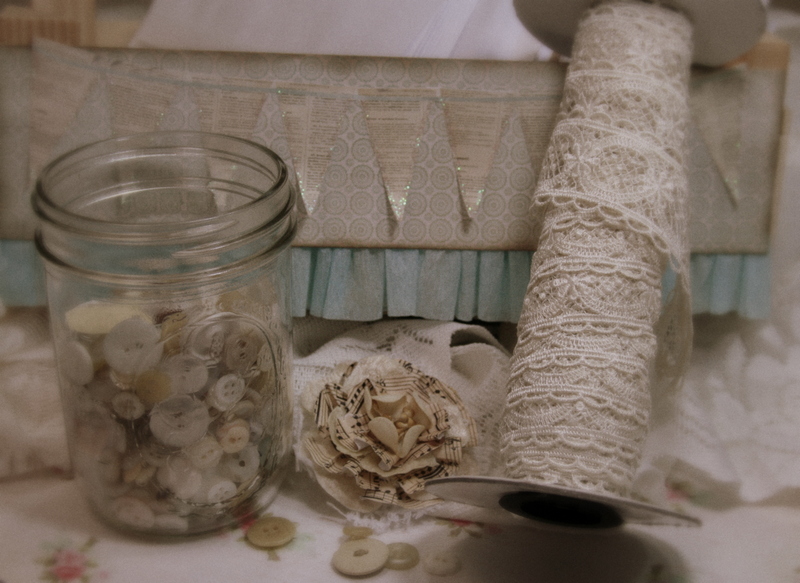 Just happened to catch my eye this morning as I am working with lot’s of shabby chic and vintage colors and patterns. Thank you sweetie for such a lovely and thoughtful gift! I think I should name her Stella. Seems to fit. I’m just popping in to deliver the promised tutorial on binding the sweet little books I have been creating. Please keep in mind that a Sharpie marker is about as technical as I have time for today…. so no fancy computer graphics for this tutorial. Please begin with 4 legal sized manilla folders. These folders are acid free and super easy to cut. I use a long armed cropper to keep everything square. Leaving the file folded as it comes in the box cut through both layers 5 5/8 inches off creating a long folded card shape. Sorry I got 1 pic ahead here….yours will just be straight across. Leaving the scored portion on the left hand side measure over 6 inches from the last score mark and trim only the top layer. This will be the front of your book. Fold your cover on the score mark. This will give you a 3/4 inch spine. There should be 3 score marks wide. Bend only the one closest to the front cover. 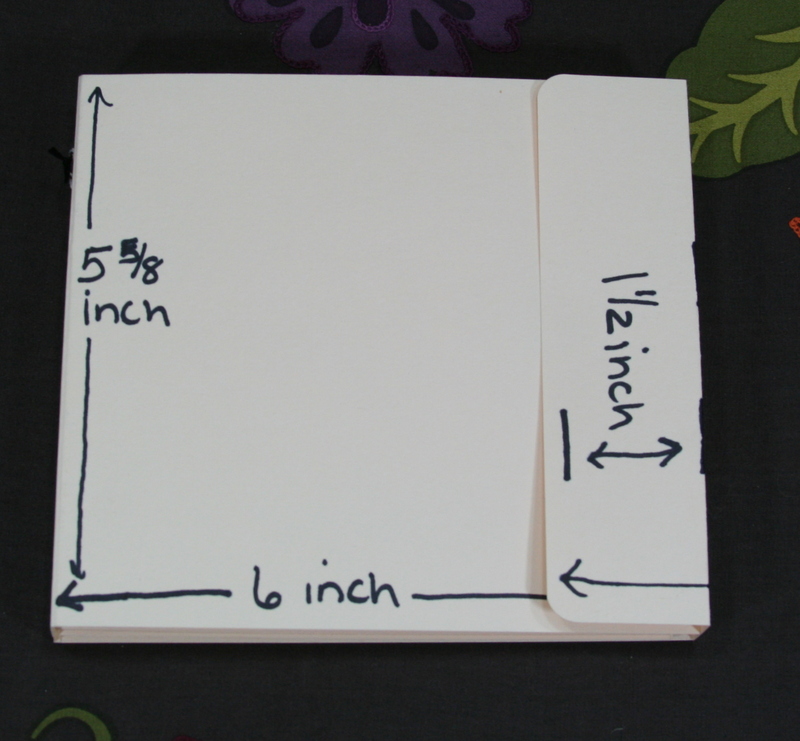 Flip the cover over and cut the length to 8 1/4 straight across. Next make a score line 1 1/2 inches in from the outside edge. Make another score line 3/4 inches from the first score line. Fold across at score lines This will give you the right hand edge and flap. View from other side showing right hand side of book cover. 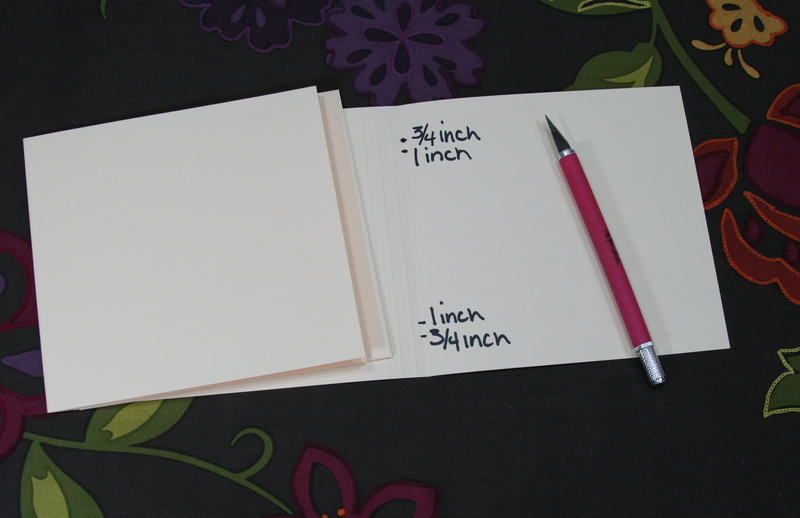 Next you will need to cut additional folders to be 5 1/2 inches high. 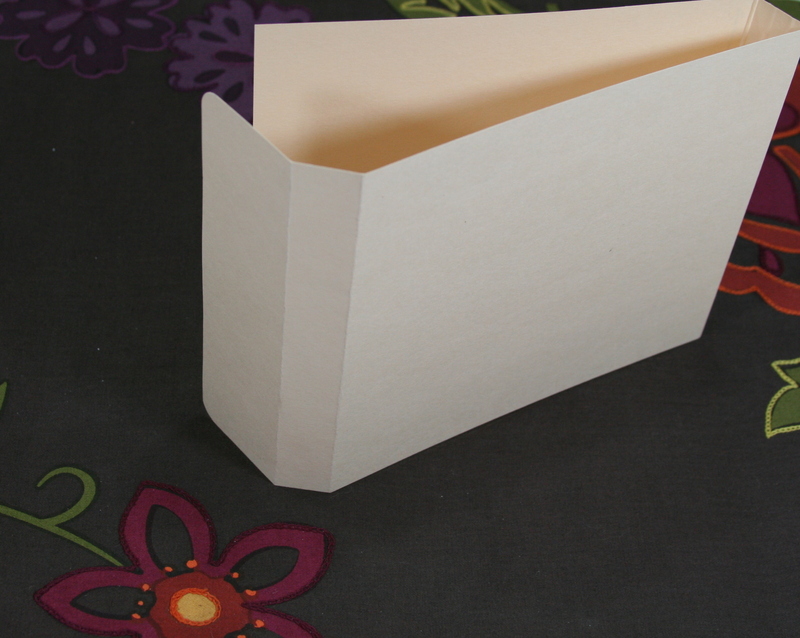 Cut through both layers again creating a folded card shape. Next cut through both layers 5 3/4 inches from the fold on the left. You will need 3 of these card shapes. 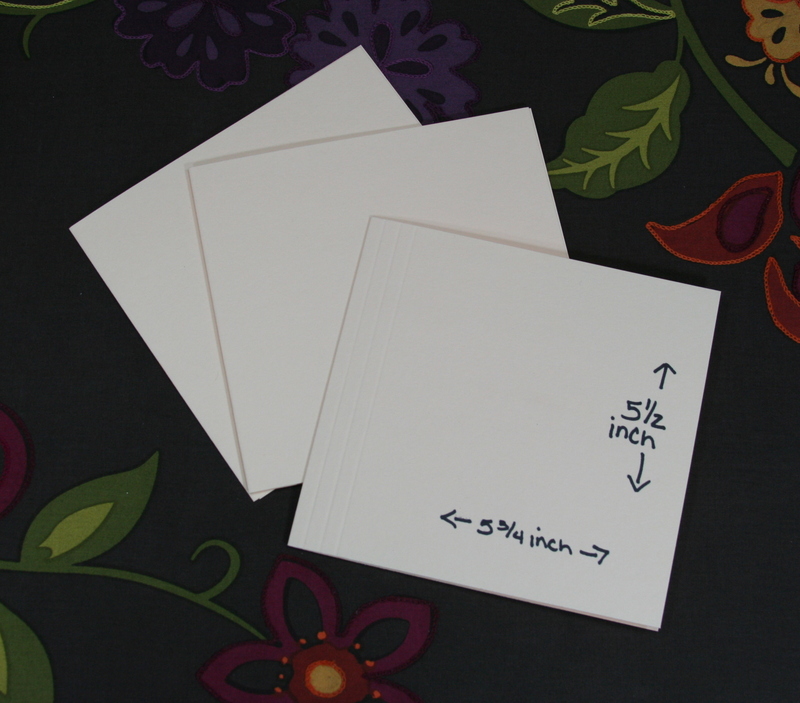 Create 3 additional card shapes in the same way but this time they should measure 5 1/2 inches high by 5 5/8 wide. Use a corner punch to make a nice finished edge on all your outside edges. Next open all cut folders and mark a spot 3/4 and 1 inch down from the top. Flip upside down and mark again at 3/4 and 1 inch. With sharp craft knife pierce tiny holes where your marks are. 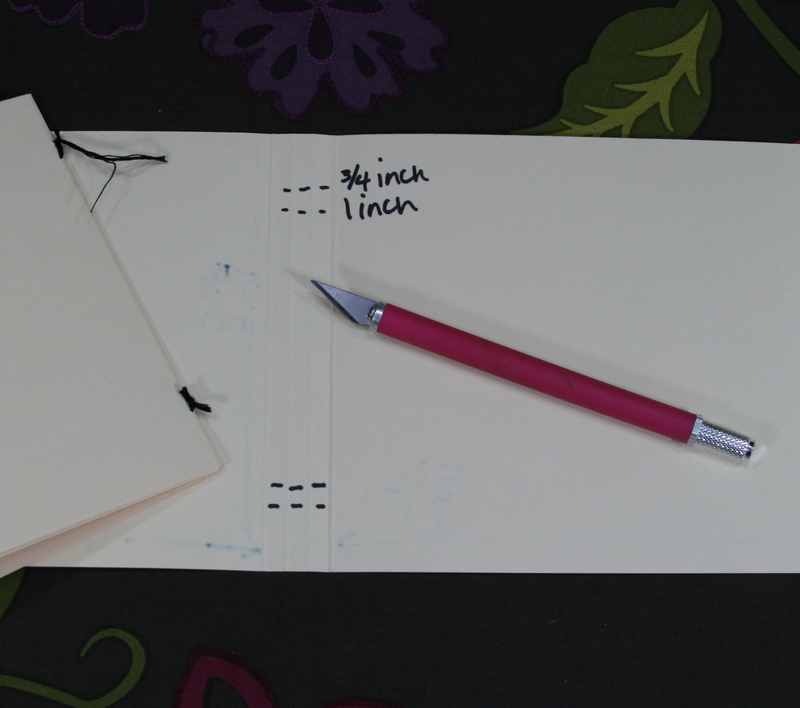 Once you’ve made a few book you can just skip marking and use your ruler and craft knife and pierce through saving a step. Please make only super tiny hole…enough to feed a large needle through. 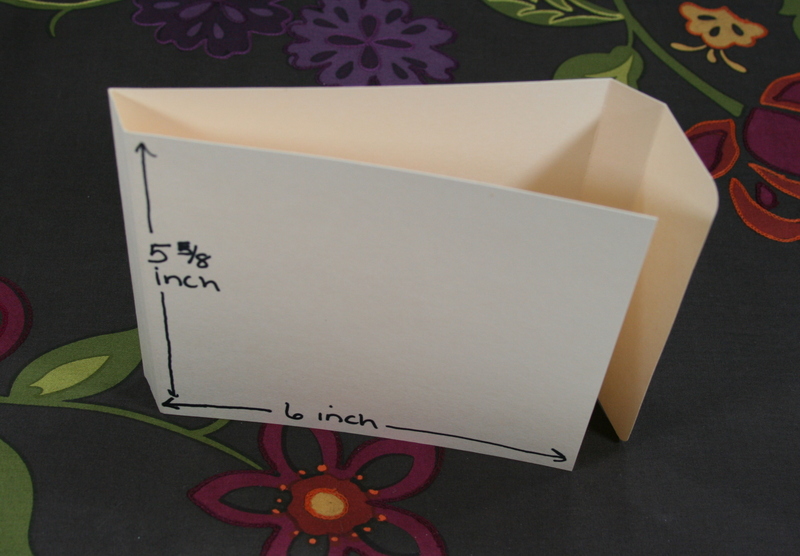 Nest 1 smaller card shape inside 1 larger shape to create insert. you will need 3 inserts for a nice amount of pages. Any less will not create a full look…any more and you may not have room to add lot’s of pictures and journaling. Sew each set through the pierced holes leaving knot on the outside. 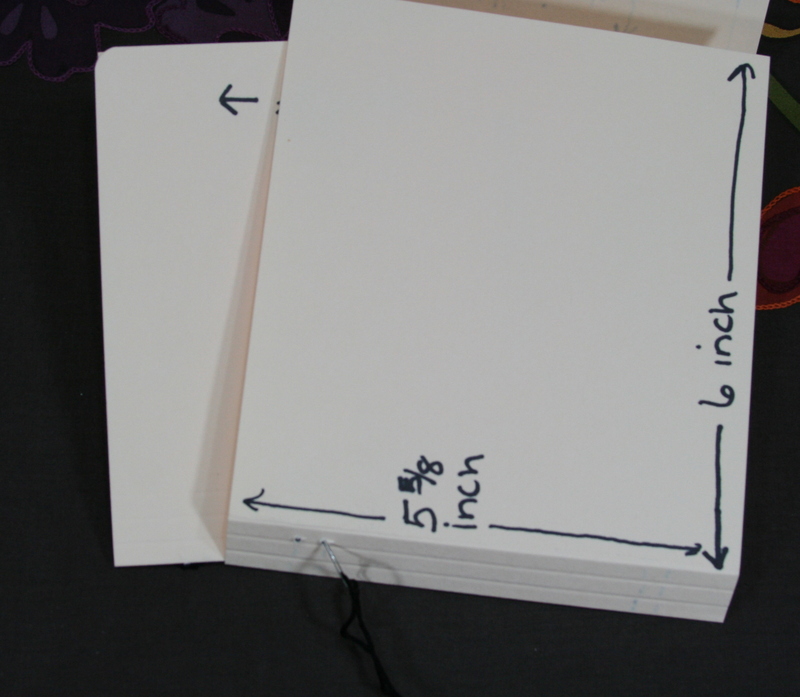 You should go through the holes several times to ensure a nice tight and strong binding. I am demonstrating with black thread to make it easier to see. You should use a good nylon thread to make it almost invisible. Please sew both sides of each insert. You now have 3 inserts sewn and ready to attach to binding. 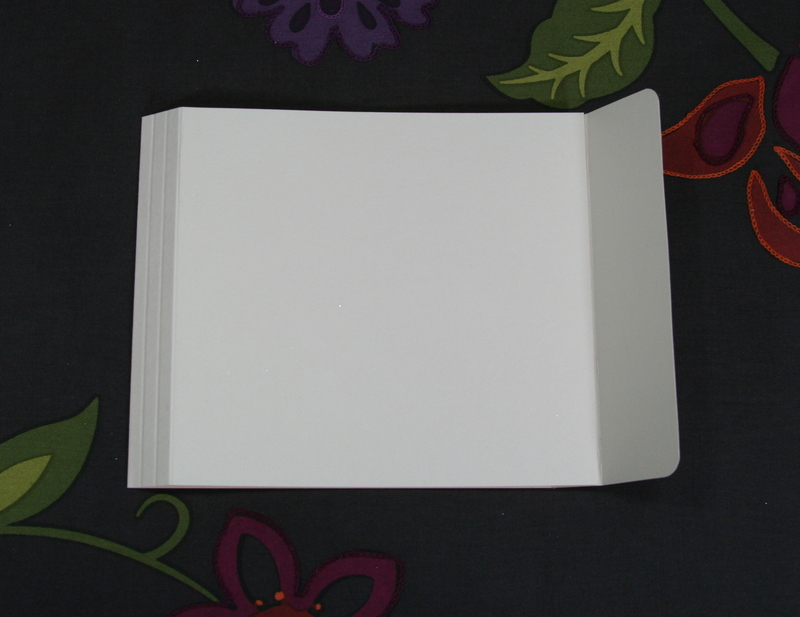 Center one of your inserts inside the cover on the inside edge of the left hand binding. 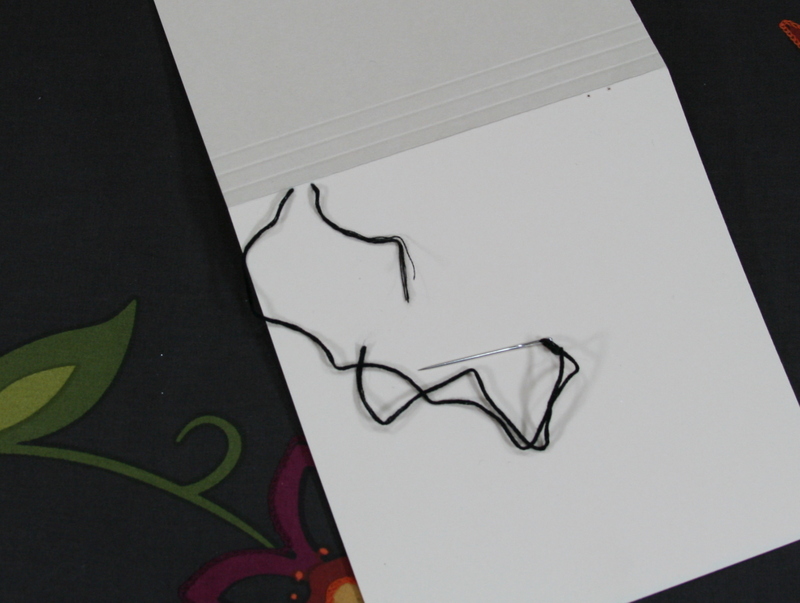 Mark your spots on the binding that correspond to the stitches on your insert. 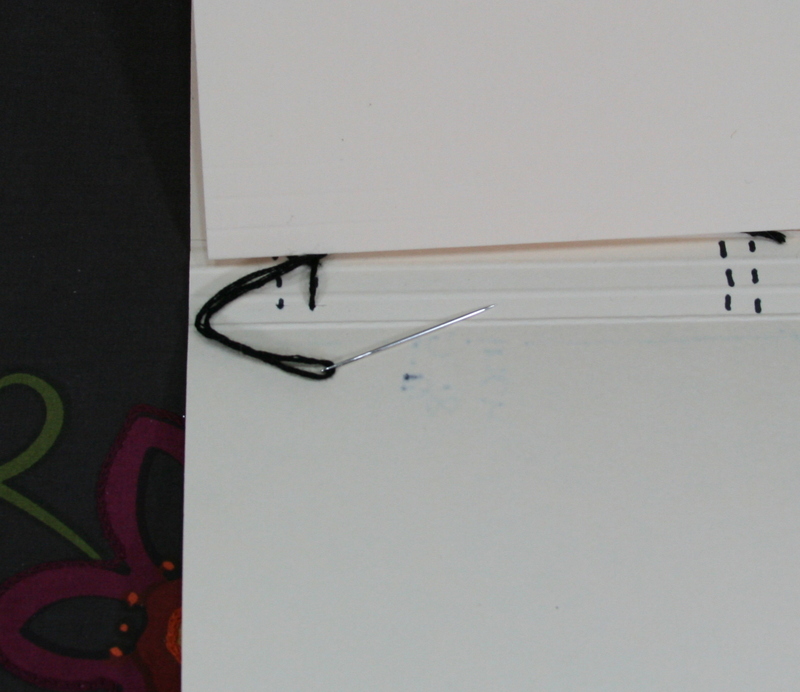 Picture shown demonstrates that you need to make 1 mark for each of the three scored sections on the binding…making 6 marks to pierce as you did the inserts. 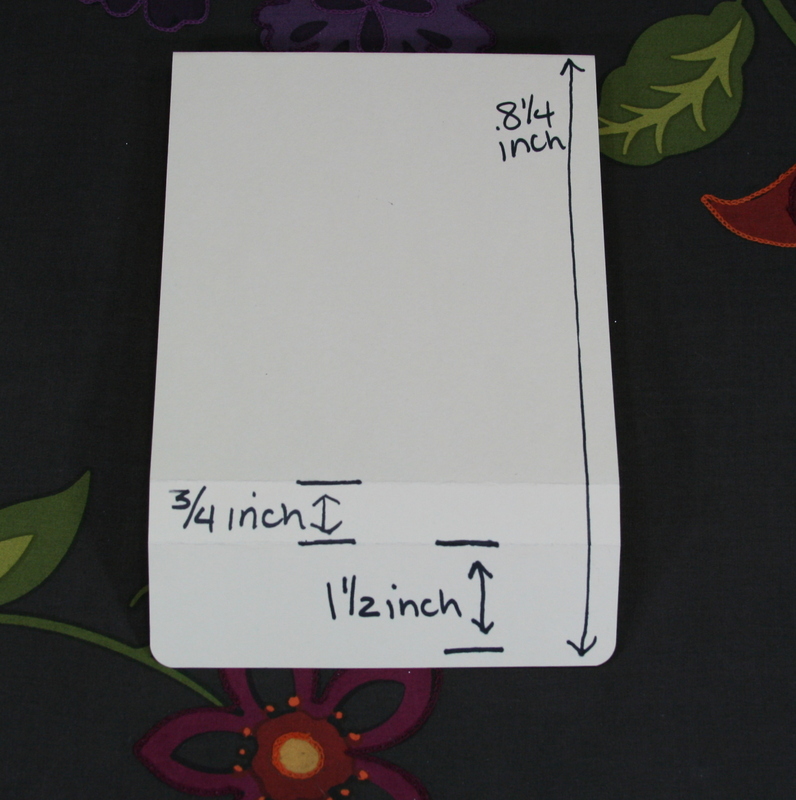 I wrote the measurements on the demonstration only for the purpose of ling up the inserts. Please do not measure down from the top and bottom as you did the inserts. This will allow a little leeway for lining up the insert in the very center. 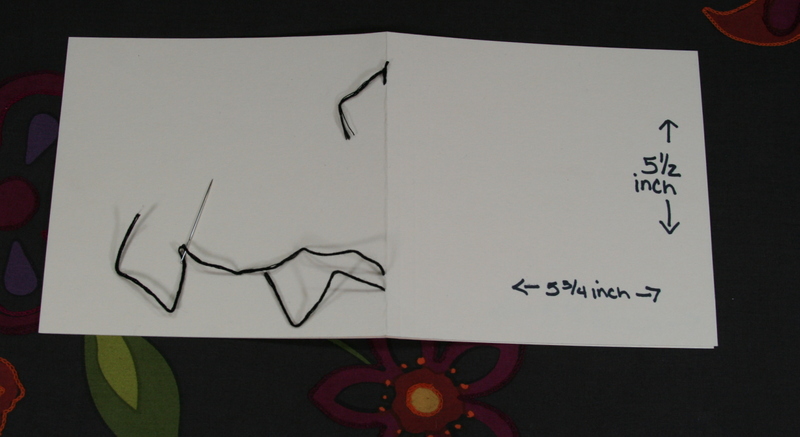 You should begin sewing your inserts in leaving the tail and knot on the outside of your book. 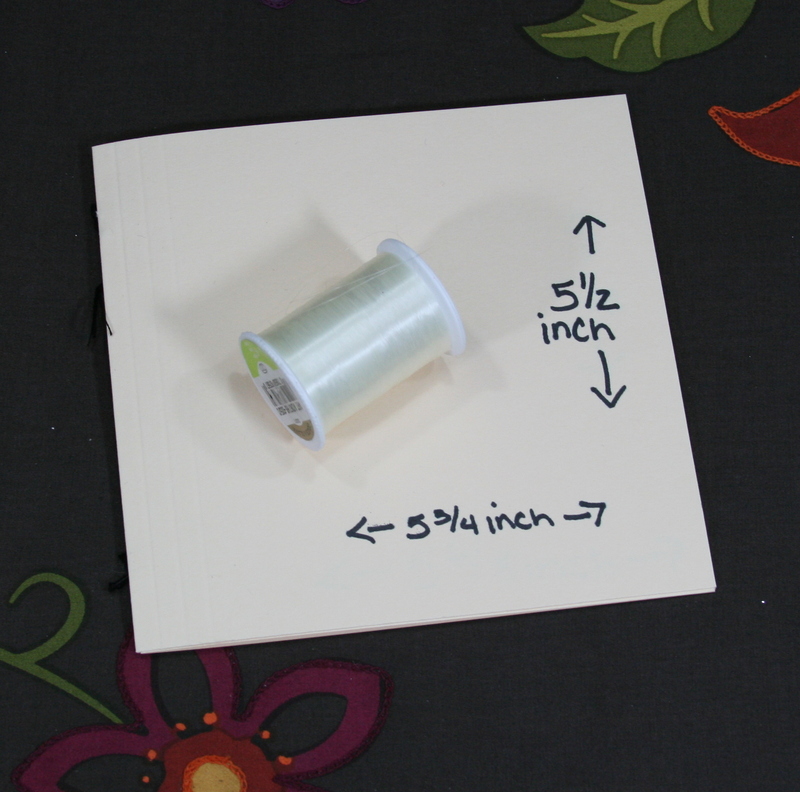 When using nylon thread this will be very easy to conceal the knot under pretty patterned paper. However nylon thread is a bit trickier to work with so don’t get frustrated. Once you’ve gone through the cover…bring your needle all the way through stitches on the outside of the inserts…then back through to the outside of the cover. 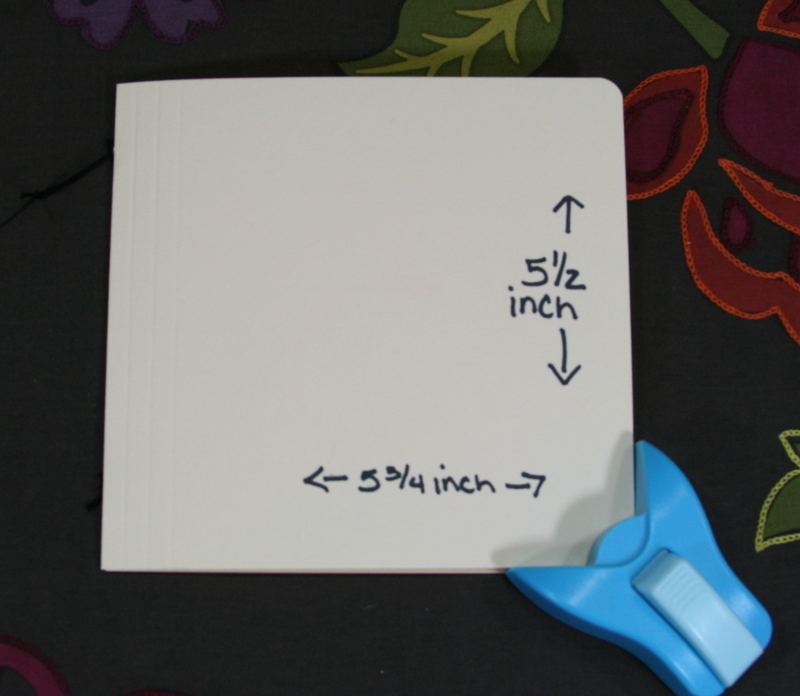 You should do this a few times to ensure a nice tight long lasting binding. Make your knot on the outside and trim excess thread. Please repeat this step until you have all three inserts sewn in. 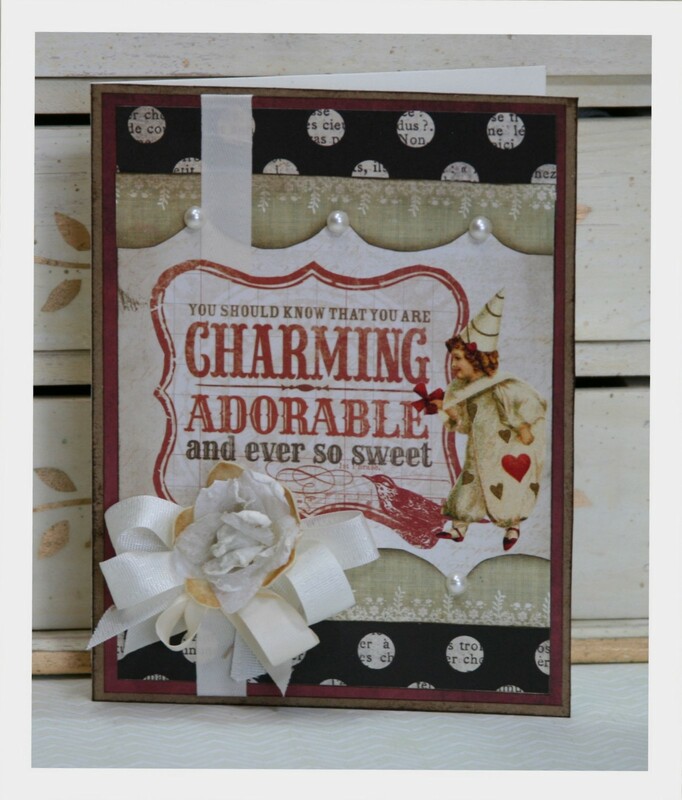 You have now created a base to add lovely papers and embellishments and make a beautiful book of your own! Please let me know if I have not explained a step well enough. Doing something is often easier than explaining how you did it. This pattern can be duplicated to a variety of sizes. 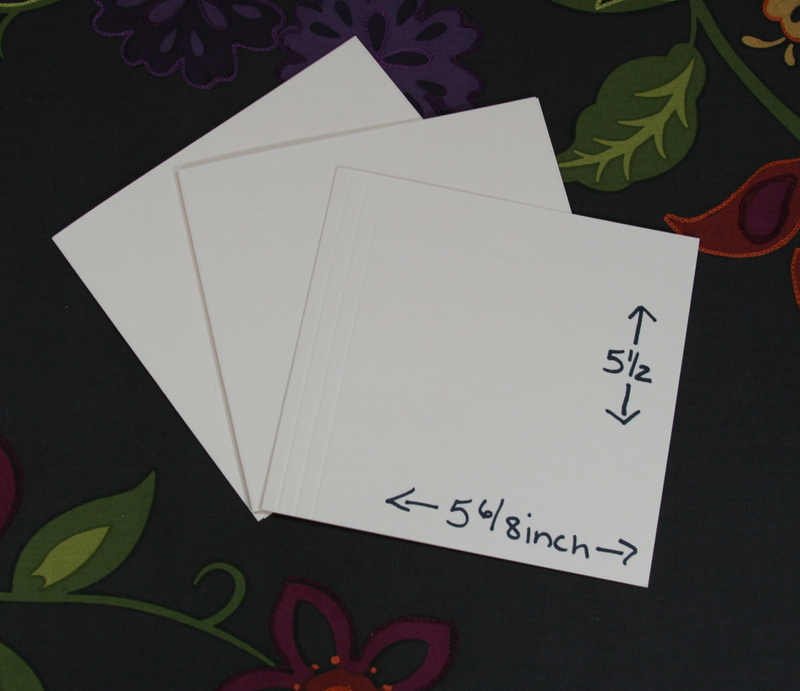 Being frugal I try to get the most out of each sheet of paper so I will keep my books a bit smaller. I also found it a lot easier to ink all the edges before I assembled and sewed all the layers.